Qurtaba heights in Islamabad is a recently launched on going residential project offers various sizes of residential apartments . 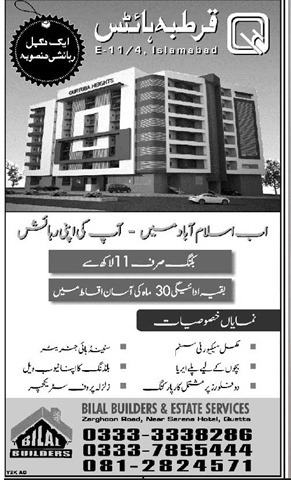 Booking is open for this project apartments are available for booking on first come first served basis . 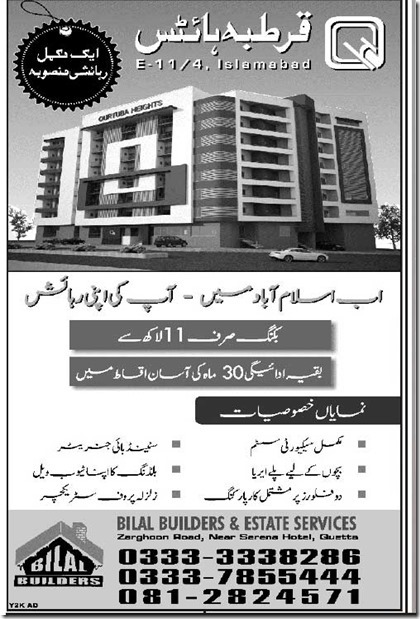 Project is located at sector E-11/ 4 Islamabad . Booking : Booking for apartments in Qurtaba Heights Islamabad is starts from Rs 11,00,000/- and rest of the amount will be paid in 30 monthly installments . Rest of the information and features of the project is mentioned in above press add .